Every massively successful business leader knows the secret to a truly successful business is an A team of employees. The late Steve Jobs himself said in an interview, “The product I am most proud of is Apple and the team I built at Apple.” It comes as no surprise that until today, Apple has one of the most stringent hiring procedures to absorb the cream of the crop into their exclusive ranks. However, putting a great team together like what Apple did may be a difficult task for small business owners especially during initial stages. Businesses at the initial stages need to invest in a wide range of expertise with as little cost as possible. It is fortunate that the boom in small businesses is accompanied by the rise of online freelance platforms, enabling small and large businesses to engage in affordable quality services. Remote employers also provide job opportunities and extra income to freelancers. All things considered, it is a win-win situation for the economy. Simply put, freelancing is flexible working. Freelancers work on a contract basis for a variety of companies, as opposed to being tied down in a company as an employee. Most work in the comfort of their homes, connecting with their clients online or via calls. They are often considered to be self-employed with the freedom of choosing projects they want to embark on. They have to market themselves actively either on online freelance platforms, professional websites such as LinkedIn or their own website to secure clients. Freelancers decide their rates based on various factors including experience/portfolio, market rates, duration of delivery and number of revisions. For larger projects, freelancers usually require a deposit to ensure clients follow through with the project. 1. Talent marketplaces will replace traditional employment models driven by "on-demand labour platforms and online work management solutions”. -Technology Vision 2017 Report, Accenture. As the Internet increasingly influences our daily lives, the nature of work is also evolving. The popularity of international online freelance platforms such as Upwork, Freelancer, Fiverr and Favser has increased the number of freelancers in recent years. In return, there is an upwards trend for companies to hire freelancers. In fact, the term "Gig Economy" was coined to describe the change in traditional employment models, whereby companies tend to hire independent contractors and freelancers instead of full-time employees. In the 2017 Flexjobs Super Survey, they listed the top 30 companies that are hiring the most freelancers, including BBC Worldwide, Accenture and CBC Radio Canada. Upwork Enterprise (Upwork’s freelance solution for companies) has served big names such as P&G, Airbnb and Dropbox among others. Meanwhile, small businesses with an extremely tight budget love Fiverr, a marketplace with services that start from $5. In 2014, 1 in every 3 Americans had done freelance work within the past year. It is only a matter of time before the freelance trend catches up in Southeast Asia, revolutionizing the modern workforce in the process. Businesses need to keep their costs at a minimum. It can be costly to hire employees especially for new businesses. With freelancers, companies are not responsible for employee benefits and insurance compensation among others. Despite paying a higher hourly rate, in the long run companies can expect a 20-30% reduction in costs. In addition, new employees often require training. 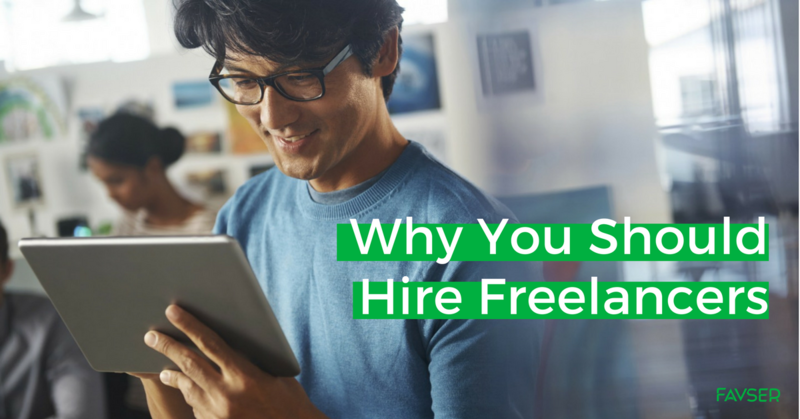 Freelancers are already skilled or experienced in the job, saving businesses time and money required to train newbies and to get the job done. READ MORE: HOW CAN FREELANCERS HELP MALAYSIAN BUSINESS OWNERS? A freelancer experiences more pressure to perform compared to an employee due to peer competition and the insecurity of short-term contracts. They work in full knowledge that if a client is dissatisfied, they can always engage another freelancer. This pushes freelancers to work hard and also offer competitive prices to attract and retain clients. Besides that, an established freelancer is comparable to a full-time employee as they bring similar skills to the table. The result is workforce cost-effectiveness, whereby businesses obtain maximum value for a reasonable cost. In the Future Workforce Report, 56% hire flexible workers to meet project demands while 49% do so to find skills unavailable in-house. Businesses may need additional skills for one-off projects or to meet scaling demands. Hiring freelancers is the perfect solution to meet these needs as there is a wide range of skills available on online freelance websites. Once a freelancer is selected and terms discussed, they can start work immediately. With access to a large pool of talent with a diverse range of skills, it is no wonder that businesses love hiring freelancers to meet their talent needs. WHERE TO HIRE MALAYSIA FREELANCERS? Interested to hire Malaysia freelancers for your next project? Favser is the right platform to hire freelancers for your business needs. Favser is Malaysia’s leading freelance platform which has over 135+ job categories. Within a few months, Favser has amassed over 6000+ active Malaysia freelancers, generating 10,000+ leads and counting. With Favser’s extensive freelancer database, simply browse through the freelancer profiles and select preferred freelancers to work with. Reach freelancers either through an inbuilt contact form or directly through phone number/email for freelancers with Favser Featured or Favser Featured Plus accounts. As freelancing becomes an increasingly popular career option, businesses should adjust their hiring preferences accordingly and take advantage of the wide range of services available on online freelance platforms. It will be interesting to witness the revolution of the future workforce with technology advancements in years to come. Register with Favser and hire professional freelancers in Malaysia.